Our office pet Beans has turned 1 and, to celebrate, we take a look at (and discuss) some of the stuff we’ve discovered about her over the last year. Now hamsters don’t really, truly, madly become domesticated in the way cats, dogs, and camels do, but they’re still very sweet little pets anyone can think of owning. Indeed, Beans has been an intriguing revelation in the Professional Moron office, and there have been many comical mishaps along the way (kind of in the style of the film Honey, I Shrunk the Kids as Beans is very small). 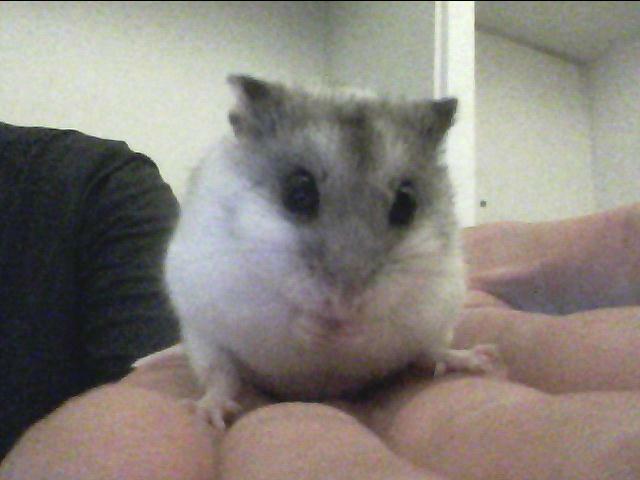 Hamsters tend to be, it’s worth noting, but she is extra small. Quite. Almost all of Beans’ most profound thinking occurs in her home, which we have affectionately named “That Cage”. She is the master of her abode and has successfully perfected a trapeze act of sorts by shimmying herself upside down along the cage roof. Groovy! She also has a habit of dragging her bedding about her cage. We suppose it’s not overly surprising a herbivore would be keen on vegetables and nuts, but Beans’ love of pumpkin seeds knows no bounds. It’s much like Scrat from those Ice Age clips where the beast is doing its damn best to keep hold of the acorn, but luckily for this happy hamster there is an inexhaustible supply of Organic Pumpkin Seeds for her to demolish. Being your own washing machine must be fun. Beans, like most things, likes to keep clean. This picture shows her doing so, which usually just involves violently rubbing at her whiskers. Now we understand her whiskers must be used for navigation etc. but, really, why just your whiskers, woman? Some things we will never be able to understand about this beast. Her shift typically begins at around 7pm and she’ll hurtle about on the wheel all day (stopping every 20 seconds or so to look around) for around 12 hours. Being nocturnal she, of course, heads off to sleep during the day. This is, of course, some nuisance to Mr. Wapojif who has to listen to her rattling away inside her cage during her wilder moments. We donut begrudge her this, mind, as it is needed exercise. At some stage during the night she rebels and flips her wheel on its side. She also has a habit of nipping staff owner’s hands when fed up of being held, whilst making insane risks and jumps is not beyond her. The little lunatic! Harry Houdini in the Niagara Falls. Beans has managed two successful escapes, the first from her cage in March 2012 (we found her making a new home in a plastic bag), the second time when the lid came off her sphere and she scurried briefly along the floor. Yes, she’s one of those sorts who thinks she’d make it in the big wide world. Beans just can’t stay still. Unless she’s asleep she’s moving and, boy oh boy oh boy oh boy, she moves like a bolt of lightening when she wants to. We blame this hyperactive nature on her whiskers. It’s an evolutionary fault! This makes keeping an eye on her somewhat difficult when she’s out of the cage as you can’t leave her be. Silly little sod. But we love her – all hail Beans! What a cute little creature!!! She certainly is, but with quite the manic violent streak to match! And the pumpkin seeds addiction is just getting worse and worse.